Confetti, or maybe ash, falls from the sky. Justine, in a wedding dress, the trim of her skirts stained with mud, trudges out into the soft deluge. This is meant to be a day of celebration, but she can’t quite bring herself to be happy. “You had one job,” her brother-in-law yells at her later, after an uncomfortable speech at the reception, where he reminds her of things she didn’t get done before she left work two weeks ago. He’s talking about her happiness and the tagline for the campaign she was working on. Justine has failed at delivering both. It’s hard enough that her work life and her family life are intertwined. She is also suffering from depression. And the planet Melancholia is on a collision course with earth. 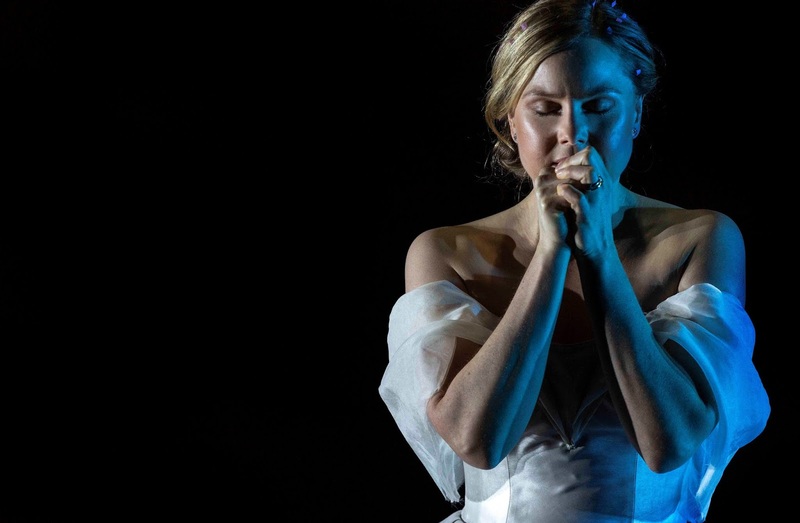 Based on the film of the same name, written and directed by Lars Von Trier, playwright Declan Greene and director Matthew Lutton have translated this epic story to the stage in a confronting and striking way. Their previous collaborations, Pompeii L.A. and I Am A Miracle, took the mundane and placed those stories into an epic tableau. Melancholia feels like a companion piece to those earlier works; frail humans elevated to the sublime. But much like the flawed characters, the production is not flawless, it has faults or maybe just fault lines. Before an actor steps foot onstage, Marg Horwell’s exquisite design tells us this is the story of the upper classes, a wedding inside a grand home, decorated with floral carpeting and a chandelier. The figure of Justine then appears, the first glimpse of Eryn Jean Norvill’s complicated, unforgettable performance. Justine has moments where she is fully in control of her life and we see this most clearly in the lyrical, poetic monologues that Declan has crafted. We are captivated by this perfectly-coiffed, grandly-styled bride who holds our unwavering attention for many long minutes during the first act. She may not be wholly thrilled by the events of her wedding day, but she can see the beauty of the world and the darkness that is on its way. Her family is there, of course, but not exactly to support her. Her mother doesn’t want to make a speech but then she drunkenly stumbles through one, in a scene-stealing performance by Maude Davey. Her brother-in-law wants to talk about work. Her sister, Claire, tries to wrangle everything so the day goes off without a hitch; she’s the control-freak of the family but maybe this is to mask a hidden pain, too. The play, much like the film (which I haven’t seen), is divided into two acts. If Justine has any semblance of control in act one, she loses it to an extended episode of depression in act two. This troubled articulate woman fades into a figure who needs help to walk and to sit and Norvill’s abilities are even more impressive in the second half than the first. She has such a command of the language and of her body that each articulation, each twitch and movement, tells a deeper story. It’s a performance that will stay with me. The second half of the production drags just a little, even as the story heads toward cataclysm. Brother-in-law John mostly attends to his and Claire’s child, after making such a strong impression in the first half. Steve Mouzakis plays him as mercurial; one minute he seems to be joking, and the next he’s going for the jugular. The mother character hangs around to little purpose later on. The relationship between Justine and Claire is central, though, and fascinating. Norvill may be allowed to command the stage more often, but Leanna Walsman proves her match when they go one-on-one, dealing with their fractured family and the end of the world. Horwell’s set goes through simple, subtle changes, while Paul Jackson’s lighting does a lot of the heavy lifting as moods and planetary alignments shift and change. 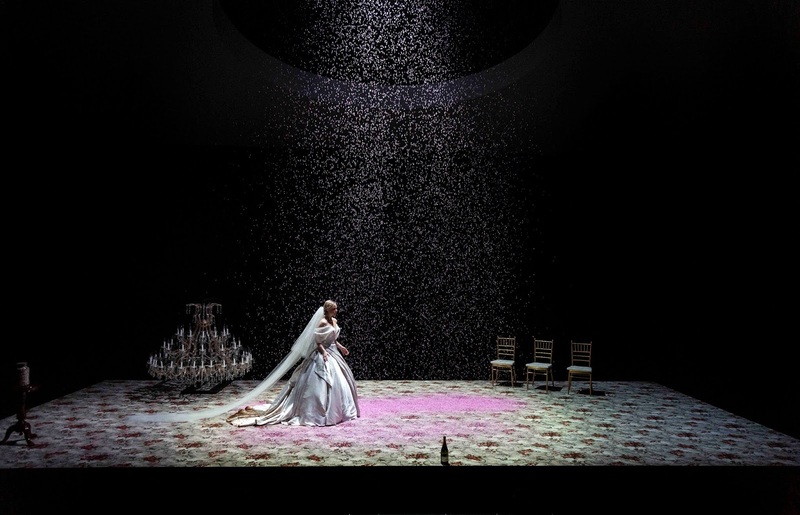 There was a moment late in the show where subtle alterations in set and lighting states made it feel like things were undulating in front of me, as if parts of the theatre itself had become unstuck, unstable. It was deeply unsettling. Melancholia is another arresting collaboration by Declan and Matthew, where beauty and darkness collide and both the epic and intimate can be mistaken for one another. Melancholia is on at the Malthouse until August 12th. A group of writers sit around hoping to devise the perfect story. It’s purgatory with fluorescent lighting. It’s Satre’s No Exit. Hell is Other Writers. It’s a creation myth birthed onto a boardroom table. It’s the writers’ room of a television show. 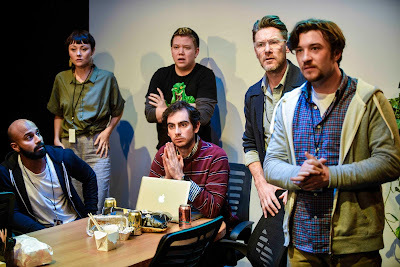 Actually, who they are and what they are doing is not made explicit, but it’s a commentary on storytelling by committee, which playwright Annie Baker seems suspicious of, even as she recognises the connections of telling stories in a group. At the head of the table is the showrunner, Sandy; revered by every writer in the room. And he’s one degree of separation from a screenwriting legend – a man who knows how to create stories forwards and backwards. Each writer in this team knows how lucky they are to have this job. To be able to create stories. To be able to tell stories. And, best of all, to make shitloads of money. The close-quarters, pressure-cooker environment is played in traverse in Red Stitch’s always-intimate space. Eight actors squeezed around a long table, occasionally visited by Sandy’s assistant, Sarah (Edwina Samuels, in a thoroughly energetic and exciting performance). The production is cramped and uncomfortable, getting messier as the show goes on. Baker’s play has a lot on its mind. In some ways, the characters themselves might be aspects of a single writer trying to put words on a page. I wondered if this was some kind of “Inside Out”-style deep-dive into the creative process; brainstorming ideas, throwing out every personal detail and trying to make sense of the wildest thought on a whiteboard. The play also tackles the commodification of storytelling and the inherent risks of a workplace where people are expected to bare their souls and pick apart their personalities for the good of the script. One of the most interesting aspects is the spectre of a writer who used to work in the room: Alejandra, a woman who the men remember only as a complainer. Not surprisingly, they never listened to her concerns about this unhealthy work environment. The text itself asks a lot of those who collaborate on it. This isn’t only a commentary on writing as team sport, it is also an ode to the importance of storytelling in an era where we’re so distracted. Sandy warns his underlings early on to put their phones away, to be present – and that is the double-edge of the writer’s life; we must write but we must live life. Trapping yourself in a room isn’t necessarily the most productive way of finding the perfect story. Director Ella Caldwell has chosen to play the naturalism of the piece, missing Baker’s tendency toward heightened naturalism which later evolves into magic realism. This production seems so concerned with the details (the food orders, the drudgery of plotting, and the cans of LaCroix mineral water) that it misses moments of the divine. The cast of characters is frustrating, on the whole. Ngaire Dawn Fair’s Eleanor is reserved throughout until she finds a moment to relate the first stories she wrote in childhood. George Lingard makes the most of Danny M2’s monologue about vulnerability, before becoming another outcast because he’s not ready to put his life on the line in service of the show. Are all these writers islands in a stream-of-consciousness? They rarely connect with each other, determined that their addition to the fabric of the story is paramount. Brian (Casey Filips) has some amusing trivial asides. Harvey Zielinski is the right amount of desperate as Josh, who is not even getting paid to be there. Late in the play, we realise these writers are trapped. It’s not just the repetition of days. They cannot go. They cannot move on. Not until they realise the perfect story. Never grasping that perfection is the enemy of the good. And that until they make choices, they’ll be spit-balling forever. Annie Baker’s The Antipodes is about people telling stories about telling stories. It knows how important that is to help us define ourselves, our experiences and our lives. Baker knows it’s what we have when we have nothing else. Red Stitch’s production captures the feeling of being trapped; the claustrophobia and the inability to measure time. Unfortunately, some of its other choices strangle this play’s apotheosis. The tone is stultifying naturalism. The magic realism doesn’t feel magical at all. The Antipodes is on at Red Stitch until August 12.